Looking for something specific? Use our search engine! Åbo Akademi University in the year 2030. How does it look? Which are our focus areas? What are we striving for? 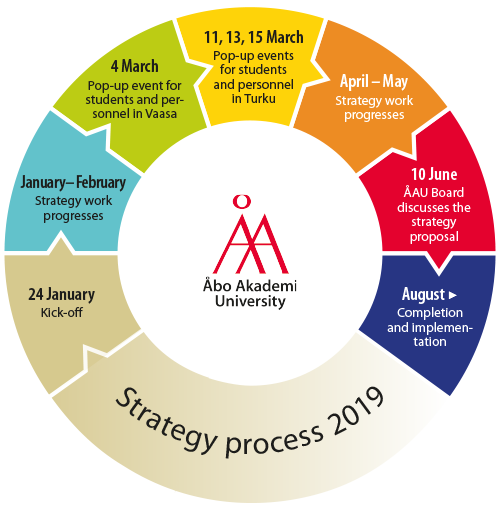 Åbo Akademi University (ÅAU) will update its strategy during 2019. The previous strategy for the years 2015–2020 will serve as starting point for the new strategy. The report Guidelines for Impact is a result of a cooperation between Åbo Akademi and Demos Helsinki and presents visions and pathways for Åbo Akademi University to prosper in a world marked by rapid and unpredictable change. The report is also background material for the Åbo Akademi 2030 process. More about the work concerning ÅAU’s social impact “Åbo Akademi University & Societal Impact” on abo.fi/impact. The strategy is the primary steering document for ÅAU. It will steer the development over the next years and provide an important tool in terms of resource allocation. Now it’s time for you to grasp the opportunity and participate in the strategy work! By doing so, you can contribute to the future of our shared university. Everyone within the ÅAU community is welcome to take part. In addition, external co-operative partners will be involved in the work. As part of the process, the strategy workgroup will approach students and members of personnel in order to gather ideas and views across the board. There will be workshops and other events for everyone to express their views. Just join the process #ÅA2030! Information about the progress of the strategy process and when and how you can contribute will be distributed, for example, on this website, through personnel news and by e-mail. On 24 January, there will be a kick-off seminar “Science in society – roles and positions in the next era”. At the seminar, the final report on the project concerning ÅAU’s societal impact will be presented. This report will serve as the basis for the new strategy work. The seminar was streamed and can be seen on Youtube. In January and February, the strategy workgroup will prepare a proposal for the strategy. The group will engage and hear various parties, both internal and external, during the course of the work. On March 4, the workgroup will be in Vaasa to meet with the delegation in Vaasa and hold a walk-in workshop close to the entrance to the lunch restaurant in Academill. The workshop is held around lunchtime. In March, pop-up events will be arranged that are open for all students and members of the personnel: Monday 11.3 at 11–14 in Arken, Wednesday 13.3 at 11–14 in ASA (outside Stora auditoriet), and Friday 15.3 at 11–14 in Gadolinia. In some events, views and opinions will be collected with the help of a special data collection tool. In April and May, the strategy workgroup will continue working in a similar manner as in January and February. The aim is to have the proposal ready by summer 2019 so that the final strategy could be approved by the ÅAU Board in autumn 2019 and then rolled out for implementation.